Steph's Stacks: This Just In: Emerald Green by Kerstin Gier has a US Release Date! 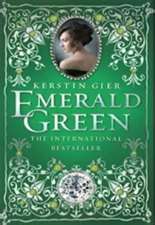 This Just In: Emerald Green by Kerstin Gier has a US Release Date! Emerald Green is scheduled to hit bookshelves and e-readers near you on October 8th, 2013! Scroll on down for some trailer action and don't forget to check out Steph's Stacks reviews of the first two books in the Ruby Red Trilogy, Ruby Red and Sapphire Blue! Plus some Shelf Candy about the covers! I just couldn't wait for Trailer Tuesday for this one, I was too excited! Enjoy! And keep reading your eyeballs out! Thank you! I was trying to find out if Emerald Green was out yet.